I invested into Silver between 2010 and August 2011…..needless to say, I have been hurt holding this Metal. If I would have been a little more open minded, I would have gone ALL IN on Bitcoin. Had I done so, i would not be going to the FOOD BANK on a weekly basis as I am now. Care to help me out? I have been following your videos on YouTube since 2010. Not only have I been following you but others like: Mike Maloney, SGTReport, drutter, etc. My initial thought is he could not have been following me very closely or with any real conviction since 2010, because I have been responsible for placing into the public domain, so that everyone who decides to invest in silver can read – and heed -– The Ten Rules of Silver Investing. 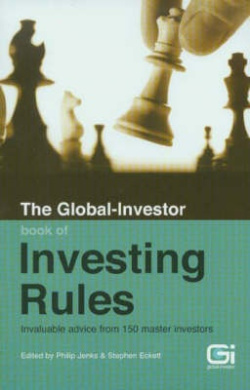 These rules are found in “The Global-Investor Book of Investing Rules,” which includes tactics, strategies and insights relied on by 150 of the world’s most respected financial experts. They are revealed in a concise, digestible form. In order to be a successful silver investor it is imperative that you stay current with what is happening in the market and with the most current investment strategies. 10. More than 10 percent is too much of a good thing. No matter how good the market looks-or how worried you are about the future of civilized society-you must always remember that silver should make up only a small portion of a well-diversified portfolio. I recommend committing no more than 10 percent of the average portfolio to silver-regardless of how strong you feel about the potential of the metals markets. Later I increased this to twenty percent as I correctly forecast the first incursion into Iraq and stated publically in San Francisco at a major investment conference, that the allocation could be increased to 20 percent. I put a SELL at the TOP OF THE SILVER MARKET in 2011!! That is correct. Had this person really been following TheMorgan Report closely, then he would have had access to the fact that we were selling at the top and not buying. The reason this issue is “touchy” is what I call the “Internet mentality”, which is an imaginary place where those connected folks are supposed to get everything and anything they wish for absolutely free. My sell recommendation was designed for our members to sell all speculative positions, all leveraged positions, and hold their core positions with a hedge in place. Bear in mind, that in many of the interviews that I was doing as the silver market really accelerated in early 2011 I publically cautioned – again and again – that if you had to buy silver at a price above $30 USD please –DO NOT BUY ALL YOU WANT. I encouraged people to wait and see, as the market was getting overheated, overbought, and too frothy. Further, my experience was that the COMEX would start to increase margin requirements to “cool” the silver market. Indeed, this did take place just as anticipated. Trust me, there were some well-known personalities in the precious metals arena who called me out privately for even suggesting a top, as silver was “certain” to go to $100 USD and my reputation would be ruined forever! As Chris Duane is often known to state, listen to all, follow none. My sell call was independent based upon many factors and certainly stands on its own merit. The author wishes he had gone all in on bitcoin and certainly looking, back many people probably feel the same way. Certainly, there were opportunities as it was first brought to our attention by Robert Prechter. Later, Trace Mayer of RuntoGold.com had called me personally and spent considerable time with me giving valuable information about Bitcoin. Had I heeded the words of either of them, a modest speculation could have proven to be quite lucrative today. For the record we were asked our opinion and here is my only public article about Bitcoin, although we have provided some insights into the topic that is important to the decision- making process for our website members. The article is titled, My Two Bits about Bitcoin. In summation, there will be those who will like this brief missive today, and those who do not. The intent of the entire team at The Morgan Report is to be of maximum service to all that follow our work – both publically and privately. Many have asked how much silver is enough to own, and of course this is a personal decision, so there is no correct answer. However, let me give you an idea to consider. The ten percent recommendation of course can apply, but to be more specific, if silver is ever valued as it has been in recent history (1800-1913) a dollar* per day would be a good living for the middle class. So a savings of 200 ounces would be equivalent to over six months of living expenses, and really more, as the constitutional amount of silver is roughly ¾ of a troy ounce, so up the savings figure by twenty-five percent. Again, this is just to give you an idea of what might be the “right” amount. Now if we go back into ancient times, which again both Chris Duane and Jason Hommel have acknowledged, one-tenth of an ounce of silver was a day’s wages for a Roman Solider. Thus you could add in a factor of ten. PS: Yes I did reach out to this person to help them out and it has yet to be determined whether or not they want to take me up on the offer. * A dollar is actually a weight, and the Treasury seems to be confused after 1985 when the Silver Liberty (commonly known as a Silver Eagle) contains exactly 1 troy ounce of 0.999 fine silver and yet it is also stamped as “One Dollar”.